Class Chickenpox visits a chocolate factory that is holding a competition to win a year’s supply of chocolates. They have to solve a cipher written in hieroglyphics and Minnie is desperate to crack it but she’s also helping Frankie, at Minelli’s Deli. 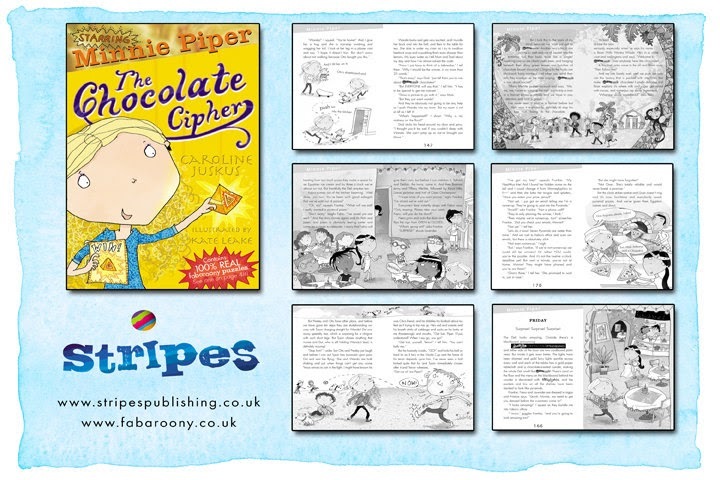 They have lots of fun making pizzas and knickerbocker glories but there isn’t much time for cracking the Chocolate Cipher. Then new girl, Lavender, stirs up trouble and Minnie and Frankie’s friendship is tested. And just when things couldn’t get much worse disaster strikes. Minnie’s dog, Wanda Wellingtons, is dognapped! Minnie is distraught. Will she ever see her dog again? Has she lost Frankie as a friend for ever? Is there any hope of winning those chocolates? It is mind-bogglingly peculiar that sometimes you think you want things, but when you get them you don’t! I haven’t a clue how it happens but it is make-me-write-things-in-a-spiral annoying. Especially as I’ve wished for oodles of chocolate… and for the half-term holiday not to be boring. But as Gran always says… BEWARE WHAT YOU WISH FOR! Tiffany Me-Me pushes forwards and says, “me, me, me, I want to wind up the tail!” but luckily a man in a hairnet blows a whistle and we have to pay attention and form a group. And we can barely wait, and we push our way into the factory that is packed with machines that make Cocoanuts chocolate! It smells delicious and Brian explains it’s where milk and sugar get mixed with cocoa and numerous top secret ingredients. “What top secret ingredients?” asks Abhi. Abhi’s a boffin and always wants to know these things, but because they’re secret Brian won’t tell him. At least I think he won’t. It’s hard to hear because the machines are so noisy and most of the workers have little foam sausages plugged in their ears to help deaden the sound. At the end of each machine is a conveyor belt and it’s a bit like being in a supermarket, but instead of carrying carrots to a till, the belts carry chocolates. And WE get to try them! There are zillions of flavours and I gobble down zingy chilli, fruity raspberry, and would-like-it-as-toothpaste breath-fresh peppermint. A lady with a badge saying Cleopatra CHOCOLATE TESTER asks me which I like the best, but my taste buds are jiggling on the tip of my tongue and I truthfully tell her that I can’t decide. And taste-tinglingly brilliant she gives me another six chocolates to help me make up my mind! And I’ve never known what I want to be when I grow up, but now I’ve decided! I’m going to be a chocolate tester! Someone has to do it and it might as well be me! And spicy chocolate orange is definitely my favourite and Cleopatra nods and ticks a box. Next we watch wrappers being printed and slipped over bars of chocolate. And the Brian moves us on and we stare goggle-eyed as boxes are stuffed with our favourite sweets, all twisted in brightly-coloured cellophane and tied shut with a ribbon. But too soon it’s time for lunch, though I’m so full from testing chocolate that I can barely nibble a thing. 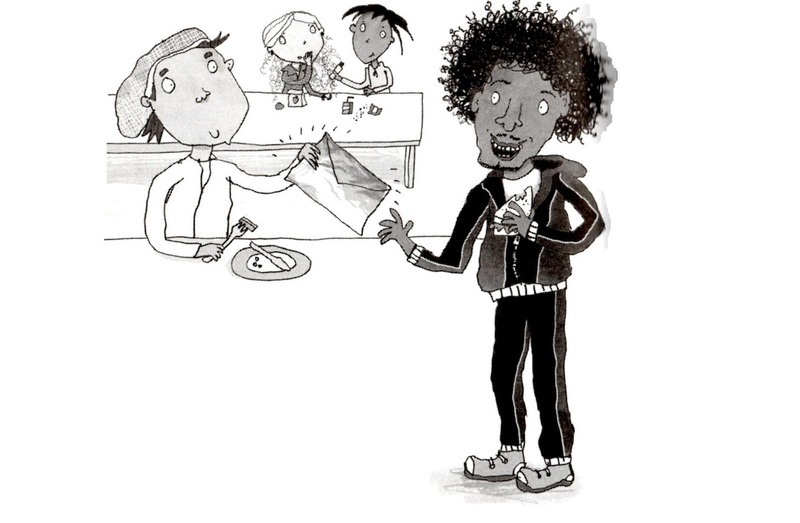 Mr Impey’s in his Friday-black tracksuit and looks like a sandwich-gobbling stick of liquorice with a mad mop of hair. He’s talking to Brian Willy Wonka Wilson and Brian winks and hands him a gold envelope that Mr Impey stashes in his bag. “What d’you think that was?” whispers Abhi. And I’m so glad that I didn’t eat much lunch because he adds, “You may all try as many as you likem but in return could you please complete a questionnaire. Now, if everyone’s ready, please, follow me!” And he takes off his hairnet and his hair’s stuck flattish to his head and we all follow hot on his heels as if we’re in a chocolate trance. Everyone pushes in a desperate attempt to be the first, but if the entrance hall was like a jungle, this room is like Ancient Egypt. The floor is covered in golden sand and the walls are made out of fake stone, carved and chiselled with hieroglyphics, or painted with pictures of mummies and pharaohs! And none of the staff are wearing hairnets, but are wrapped in togas, even Brian, who must’ve been hiding his under his coat! The ladies have black painted around their eyes, and in their hands are platters of jewels, which on closer inspection are gold chocolates! “They must be the pyramids!” whispers Abhi. And he cuts a string and the paper drops to reveal a sparkling gold pyramid. And it’s even taller than Brian and is actually a pyramid made out of Chocolate Gold Pyramids! “Da-daaah!” sings Brian, as we each get handed three chocolates. They look so nice that it’s almost a shame to have to peel one, but I tear off the foil and ite the top and gooey caramel spills down my chin. And I don’t care because it’s so delicious! “Let’s guess what the secret ingredients are,” whispers Abhi. And we fill out the questionnaires and we’re supposed to award them marks out of ten, but me and Abhi give them eleven, though we each nibble another three to make trebly sure that we’re telling the truth! 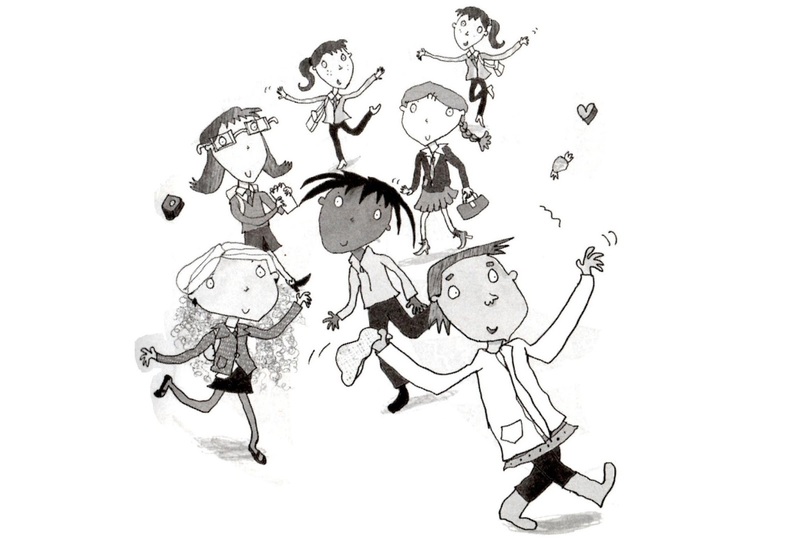 “This has been the best school day ever.” says Abhi. “Perhaps we could get ourselves locked in!” I suggest. And we’re about to plan where we might hide when Brian blows his whistle for the very last time. He wishes us a safe journey home, and hopes we had a fun day and that we’ll tell everyone how yummy his chocolates are. And we all nod as Cleopatra whispers something in his ear. And just like Brian, I’d completely forgotten about the competition! How scrummy is that? A dreamily delicious Chocolate Gold Pyramid could drop through my letterbox and on to my tongue every day for a whole year! And it meand leaving Cocoanuts is not so sad because I’ve got something tasty to look forward to. And a goody bag! But Abhi’s feeling queasy because the vibrations of the coach are stirring up all the chocolate in his tummy. Plus, it’s not a hairnet! It’s a stack of gold paper. And I can hardly wait and I pay no attention to what he says next as it contains the words half-term and hommework. 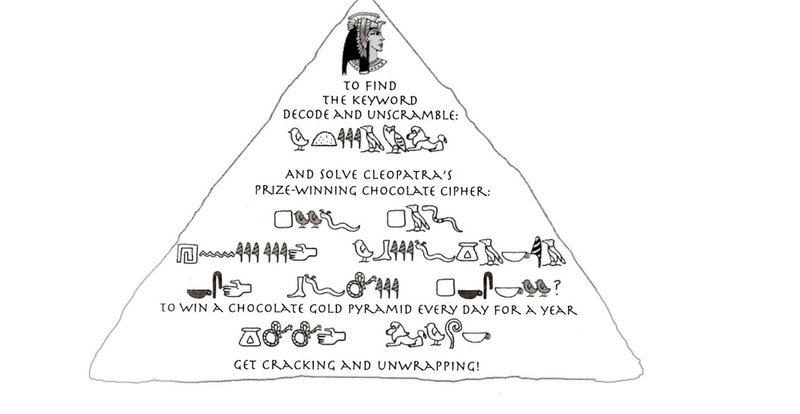 ARE YOU BRAINIACALLY CLEVER ENOUGH TO CRACK CLEOPATRA’S CHOCOLATE CIPHER TOO??? It’s based on a KEYWORD CIPHER. 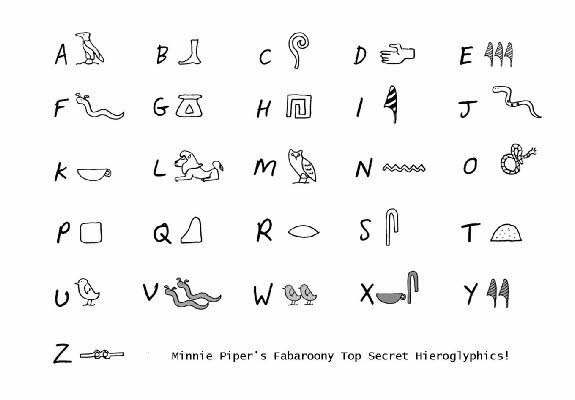 You can learn all about Keyword Ciphers and how to solve them in The Ladybird Code and then you can try and solve Cleopatra’s Chocolate Cipher along with Minnie! 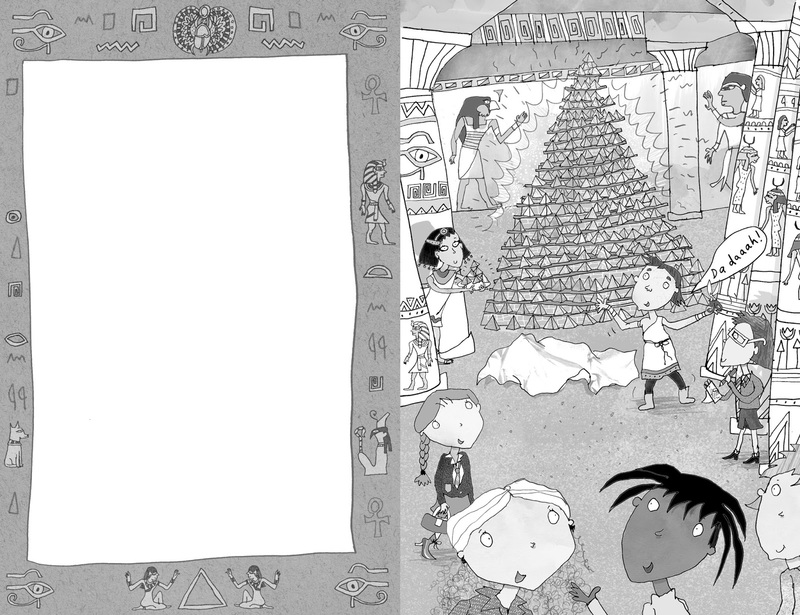 There are lots of other puzzles woven into the story too. 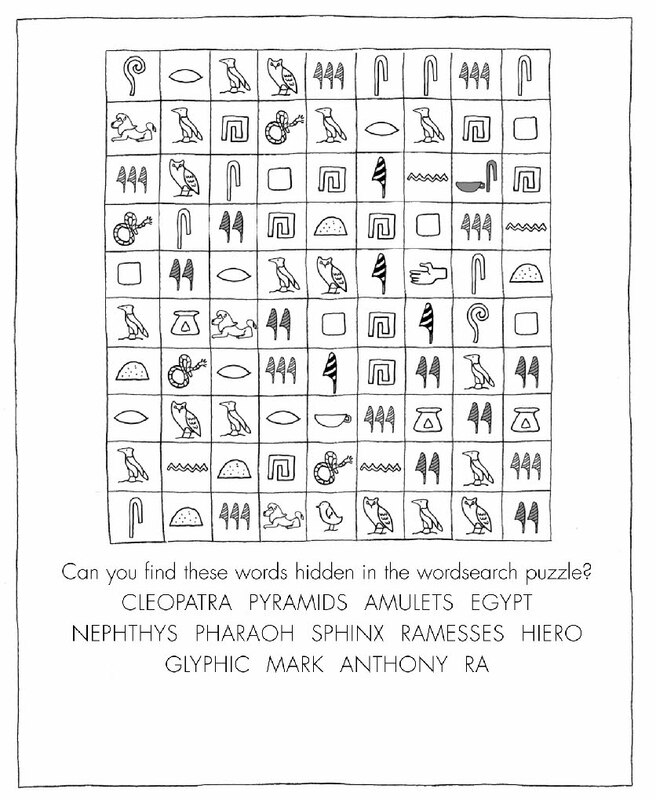 Here are the hieroglyphics to help you. GOOD LUCK! Hope it doesn’t scramble your brain cells!